This article is a review of several books written by Kuyper and about Kuyper in the past two years. Hierdie artikel is 'n hersiening van verskeie boeke geskryf deur Kuyper en oor Kuyper in die laaste twee jaar. Recent years are proving to be an excellent time for Kuyperania. Several new books have been published recently: three by Kuyper, one collection of articles on and about Kuyper, one massive annotated bibliography of Kuyper's writings, one biography and one on Kuyper's ecclesiology (see References section at the end of this article). What follows is a review of six of them - as I am one of the co-editors of On Kuyper: A collection of readings on the life, work & legacy of Abraham Kuyper (see Bishop & Kok 2013), I shall refrain from further comment on it. Neo-Calvinists are often accused of minimising the place of the church in the kingdom of God. This certainly was not the case for the founder of neo-Calvinism, Abraham Kuyper (1837-1920). Kuyper's first and last articles were on the church. As John Halsey Wood Jr. (2013) notes, the church was the bookends of Kuyper's theological writings. Kuyper was a pastor in a church, led a reform of the Dutch church and wrote his doctorate on Calvin and à Lasco's views of the church. Rooted and grounded: The church as organism and institution is his newly translated inaugural speech, delivered to his new congregation in Amsterdam; it develops the idea of the church as institution and as organism. Kuyper (2013:22) always had a deep concern for the church: as he said, the 'church question dominates every other issue'. In a sense, Kuyper turned from studying church history to making church history. Wood (2013) points out in the 'Introduction' that Kuyper was here addressing two questions: 'What is the church?' and 'What is its position in the emerging society?' These were key issues then and are even more so today. This lecture was delivered in 1870 when Kuyper was aged 33. (The original Dutch publication is numbered 1870.25 in T. Kuipers's (2011) annotated bibliography.) During this time Kuyper was struggling with the liberalism and modernism that had gripped the Dutch Reformed Church. It was 16 years later in 1886 that he would lead a secession from the National Church and form the Doleantie. For Kuyper the church had to be free: free from money, from state control and ecclesiastical hierarchy. The church is based on God's eternal election; it is not a human creation. There is growth and building; planting and organisation: 'From the organism the institution is born, but also through the institution the organism is fed' - both are needed; theirs is a symbiotic relationship. The Reformed Church is both an organism and an institution. Its foundation is God's word; God's eternal election is its heart and blood. The church is a response to sin. Without sin and the fall there would be no need for the church: 'Leave sin out of consideration, and the church becomes inconceivable, since the world itself would then be the church'. He places a strong emphasis on the priesthood of all believers. For the church to be truly an institution and organic the role of the institutional leaders must be to equip the church as organism to be able to do the works of service in the marketplace, in the classroom, in business, in politics, in the laboratory. 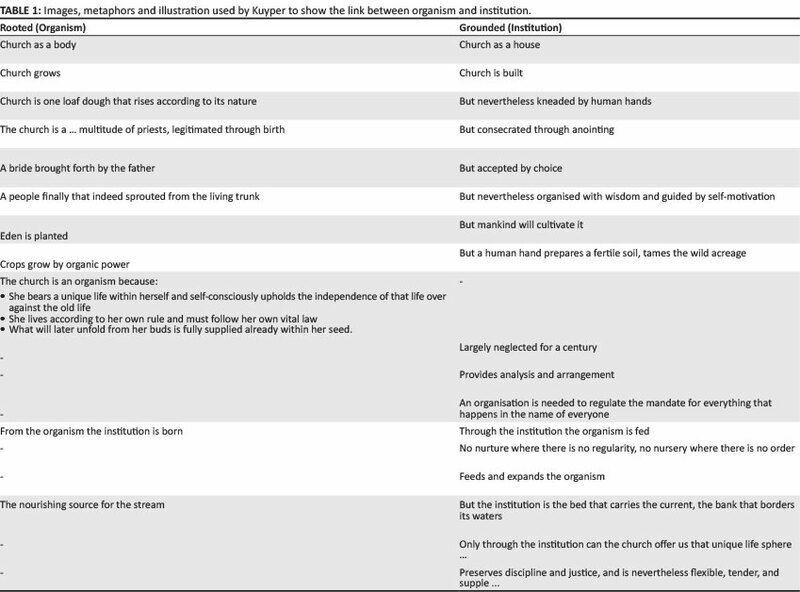 Table 1 shows some of the images, metaphors and illustrations that Kuyper uses to show the link between organism and institution. Rooted and grounded: The church as organism and institution is an important book that helps to show the importance of ecclesiology in Kuyper's theology. Kuyper's (2013) view of the church is also the subject of John Halsey Wood Jr.'s (2013) PhD thesis. This has now been published by Oxford University Press as Going Dutch in the modern age. Wood opens the book with Kuyper's panel-sawing (panelzagerij) incident: Kuyper breaking into a church. Some saw this as an 'illegal power grab' others as a legitimate act of defiance against an overreaching Constitutory board. The panel-sawing incident was the result of Kuyper and others being suspended by the Classical board and it ended in the formation of a secession, led by Kuyper, from the Dutch National Church. Wood's book seeks to understand Kuyper's theology of the nature of the church. It is a history of Kuyper's church doctrine placing it in a clear cultural and historical context. He attempts not only to hear what Kuyper said about the church but also what he did regarding the church. So the panel-sawing incident is an apposite start. Wood (2013) takes its 'controlling methodological questions' from Troeltsch, who uses the typology church-sect-mysticism to describe ecclesiology. Wood uses these in an attempt to analyse Kuyper without attempting to fit him into these categories. He seeks to build upon Jasper Vree (see, amongst others: Vree 1998), Van Leeuwen (1946) and Zwaanstra's (1974) work on Kuyper's ecclesiology. Vree (1998:86) remarked of Kuyper that he 'continually adapted his ideal of being church according to (changes in) reality'. Wood has shown that this is the case and also that Kuyper's public theology adapted as his views of the church changed. Wood's (2013) final chapter is a tour de force. All the pieces of the previous chapters on the French Revolution, a believer's church, his baptismal theology and his proposals for church and state are brilliantly drawn together. Although the focus has been on Kuyper's ecclesiology, it is through this lens that his public theology is seen. There has been a tendency to look at either Kuyper's ecclesiology (Europe) or at his public theology (North America). Wood (2013) has bucked the trend: a North American looking at ecclesiology. What Wood does, however, is to show that the two are intertwined. Kuyper's ecclesiology arises out of his public theology and his public theology arose out of the 'church question': How do we make a private church public? Kuyper developed a public theology only after the formation of his secession church - he did not need one until then. Wood provides an excellent analysis of Kuyper's understanding of the nature and mission of the church. Considering the book is a published version of his PhD thesis, it is remarkably accessible and readable. It will be indispensable for all who want to know more about Kuyper and the church. Kuyper was obviously a multi-faceted character. He has been described as 'an opponent of ten heads and a hundred hands' ('Biographical note' in Kuyper 1931:iii). Harinck's edited important little book, Kuyper in America: This is where I was meant to be, gives us glimpses of Kuyper's human side (see Kuyper 2012). Kuyper visited America in 1898 to deliver the Stone lectures and receive an honorary doctorate from Princeton. Peter Heslam (1998) has looked in detail at the background of the lectures and his visit; here we have Kuyper's perspective. What are presented are Kuyper's thoughts and feelings during that five-month visit conveyed through the letters that he wrote to his wife and children whilst he was away. This book is a translation of the 2004 Dutch book Ik voel steeds meer dat ik hier zijn moest: Amerikaanse brieven van Abraham Kuyper aan zijn vrouw en kinderen (1898).1 This slim volume contains the 22 letters written to his family. It is part travel journal, part insight into his views of America, part insight into his own thoughts and feelings. We also experience the loneliness and separation he feels from his family. Several of the letters start with how upset he feels at the lack of letters from them: 'That was quite a disappointment this week not to hear anything from home' (Kuyper 2013:19, letter 5) and '... I still have not received a word from home whilst in America' (ibid:22, letter 6). Numerous times Kuyper (2013) writes positively about the United States of America, though he does not seem enamoured of most of the food! We are also given glimpses into the state of his health. He continually reminds his family that he is getting older - he turned 61 during the trip - and that his health is not what it used to be; we have numerous mentions of his dental problems, his diarrhoea (he is that open!) and how he is coping (or not) with the unusual September heat wave. Dagmare Hounier, with help from Harry Van Dyke, translated the letters. I cannot comment on the accuracy of the translation, but it certainly reads well and smoothly in the English. The book is well illustrated with photos of his ship, his wife, Gerhard Vos, B.B. Warfield, the places he stayed and several newspaper clippings. There are useful footnotes; these help fill out the details often implied in the letters and provide brief biographical notes of the people he mentions. The letters are sandwiched between a name index and a helpful introduction by Harinck. There is also the travel schedule. All in all, this book provides a fascinating insight into the mind of Kuyper. Another fascinating insight into Kuyper is provided by Bratt's (2013) biography. The publishers have described this as the first full-scale biography in English. Although it is certainly not the first English biography, it is without doubt the most definitive one to date. We have been reasonably served with Kuyper biographies, ranging from the hagiographic (e.g. Vanden Berg 1960, a translation from the Dutch) and under-critical (Praamsma (1985) - another translation) to the over-critical (e.g. Koch's (2006) - this has yet to be translated). Bratt (2013) steers a middle course. The first book-length biography written in English was by McGoldrick (2000): God's renaissance man drew largely upon Vanden Berg (1960) and Praamsma (1985) and focuses primarily on Kuyper's theological views. Bratt's perspective is wider. The chapter titles give some flavour of the scope of Bratt's (2013) biography and of Kuyer's life and influence; these include: political theorist (ibid:ch. 7); Church reformer (ibid:ch. 8); Theologian of the church (ch 9); Theologian of culture (ibid:ch. 10); Christian democrat (ibid:ch. 11). Inevitably, a 450-page book will have its limitations. I would have liked to have seen a little more on Kuyper as founder of the Vrije Universiteit (VU University). The VU University and education played a key role in Kuyper's strategy and this, it seems to me, is slightly downplayed in Bratt's approach. In his introduction Bratt (ibid:xxv) notes that Putchinger gave him some advice: 'First you'll love the man, then you'll detest him, finally you'll understand him. Then you're ready to write'. Bratt has gone through those stages and has a realistic view of the man: a 'great man but not a nice one' (ibid:xxi). This puts Bratt in a good place to write about Kuyper. Bratt (2013) does an excellent job of placing Kuyper in his cultural and political context. He examines many of Kuyper's influences and explores the parallels between Kuyper and his contemporaries. Bratt draws upon many of the key Dutch works by Kuyper and others. There is a 14-page index and the bibliographic notes stretch to 44 pages. Particularly helpful are the descriptions and evaluations of Kuyper's writings, especially those not yet translated. Bratt is very good at placing these in their cultural milieu. One frustration was the way the references have been done -there are no footnotes or endnotes, but a brief bibliographic essay for each chapter at the end of the book, this makes finding the source of a quotation rather difficult, though it does have the advantage of not breaking up the text with references. The book is eminently readable. If you want to know more about Kuyper, this is perhaps the best place to start. I shall certainly be returning to it again and again. Bratt notes that it has taken many years to complete - it has been worth the wait! Abraham Kuyper: An annotated bibliography is the first full bibliography of Kuyper's work. It was originally written in Dutch by Kuipers (2011) but translated by Clifford Anderson for publication in English. Each entry is dated and numbered. The information for each entry comprises: title, place, publisher, year, the number of pages, size, edition, the print run, the date of the preface, the name of the translator, where appropriate, as well as several paragraphs giving the background and overview of each piece. It strives to be as complete as possible, identifying all of Kuyper's printed works, the exceptions are the articles in De Heraut and De Standaard. If these were included, it would probably double its already massive 756 pages. Web articles are not included; neither are print-on-demand books. .01 Rooted & grounded: The Church as organism and institution Grand Rapids, MI, Christian's Library Press 2013. xxv + 45 pp., 21.4 x 13.6 x 0.8 cm - £3.29/$4.99. Preface by Kuyper dated: Amsterdam, 10 August 1870. On the translator, see 2011.01 (below). Christian's Library Press is an imprint of the Acton Institute for the Study of Religion & Liberty. This was first published as a kindle e-book (23 March 2013) and then as a paperback. It contains a translator's preface, and a foreword and introduction by John Halsey Wood Jr. The cover was designed by Sharon VanLoozenoord. It was edited by Chris Robertson, Timothy J. Beals and Donna Huisjen. It is a translation of Kuyper's inaugural sermon given in the Nieuwe Kerk in Amsterdam on 10 August 1870. The book has an inscription: 'For Dr. Rimmer de Vries'. Some items are listed as 'n.v' (non vide, not seen), but these are few and far between. This volume is an invaluable tool for Kuyper researchers. It includes a foreword by Harinck, a chronology of key Kuyper dates - which strangely omits any family dates such as births or marriages. Another book translated too late for inclusion in this bibliography is Wisdom and wonder: Common grace in science and art (Kuyper 2011). This is the first fruits of a major project to translate Kuyper's De gemeene gratie by the Common Grace Translation Project. Organisations working together on the Project are the Acton Institute and Kuyper College together with Calvin College, Fuller Theological Seminary, Mid-America Reformed Seminary and the Andreas Center for Reformed Scholarship and Service at Dordt College. .01 Wisdom & wonder: Common grace in science & art. Grand Rapids, MI, Christian's Library Press 2011. 191 pp., 21.4 x 13.6 x 0.8 cm - £10.07 (pbk)/ $24.99 (hbk). Preface by translator: 16 August 2011. On the cover: Foreword by Gabe Lyons and Jon Tyson, Introduction by Vincent Bacote. The translator, Nelson Deyo Kloosterman (Calvin Theological Seminary, MDiv, 1975; Theologische Hogeschool van de Gereformeerde Kerken in Nederland, Kampen, ThD, 1992), serves as Ethics Consultant for Worldview Resources International, St John's Indiana, USA. He is the co-translator of the forthcoming Common grace and Pro rege for the Common Grace Translation Project. This is the first published part of the Common Grace Translation Project. It is a translation of De gemeene gratie in wetenschap en kunst. These were originally a separate edition of the final ten articles of the common grace series by Kuyper published in De Heraut from 5 May to 14 July 1901. The chapters deal with common grace in science and in the arts. This book was first published in Dutch in 1905 as a supplement to De gemeene gratie.2 These chapters had been accidentally left out by the publisher of the three volumes that comprised Kuyper's newspaper series on common grace from De Heraut3 and so were published separately. The book is in two parts: Part 1 on science and Part 2 on art. The original title of the book was De gemeene gratie in wetenschap en kunst (Common grace in science and art). The difference with which science and art are treated is marked. In the science chapters there is much emphasis on two kinds of knowledge, two kinds of people - the antithesis; but this is largely missing from the section on art. The pivotal chapter is the one on education. It acts like a hinge joining the chapters on science to those on art. The key focus in that chapter is the need for and the role of a Christian university. Kuyper was writing this series between 1895 and 1901. Uppermost in his mind would have been the education issue and the events that led to the founding of the VU University in 1880. Here he is underlining the need for Christian education, an education that would prevent a public-private divide which leads to a schizophrenic Christianity. Interesting is the difference Kuyper places on the level of science - he seems to be adopting Warfield's position - in that the so-called higher sciences, the social sciences, are more influenced by subjectivity than the lower mathematical and physical sciences. The emphasis on the consummated kingdom in the discussion on art is another important emphasis of Kuyper's. Beauty has been affected by the fall, but common grace has preserved us from a complete loss of beauty. In the kingdom of glory there will be a higher degree of beauty; it will be restored and more. Art foreshadows and provides us with prophetic glimmerings of the New Jerusalem. It provides a form of bridge between the now and the not yet of the kingdom. • without it, non-Christian science would provide us with misleading information. This is an important work of Kuyper's. It is an important work for today. It reinforces the role of common grace and shows that science and art are important aspects of our Christian discipleship. Discipleship is not meant to be a part-time activity, something that we do on weekends and in our leisure time; discipleship is about redeeming all of life. As Kuyper (2011) puts it, 'thinking is a spiritual activity'. These books all provide insights into the polymath and multi-faceted person who was Kuyper. The key theme that arises from these books is how important the church question was to Kuyper, and Wood (2013) has shown that it was the church issue that shaped his public theology. 1.This is 2004.03 in Kuipers's (2011) annotated bibliography. 2.1905.21 in Kuipers's (2011) annotated bibliography. 3.The three volumes were: De gemeene gratie. Eerste deel. Het geschiedkundig gedeelte (1902.13); De gemeene gratie. Tweede deel. Het leerstelling gedeelte (1903.13); De gemeene gratie. Derde Deel. Het practische gedeelte (1905.08) (see Kuipers 2011). The three volumes covered historical, dogmatic and practical aspects of common grace. A partial translation is found in Bratt (1998).